get your minds out of the gutter, people! 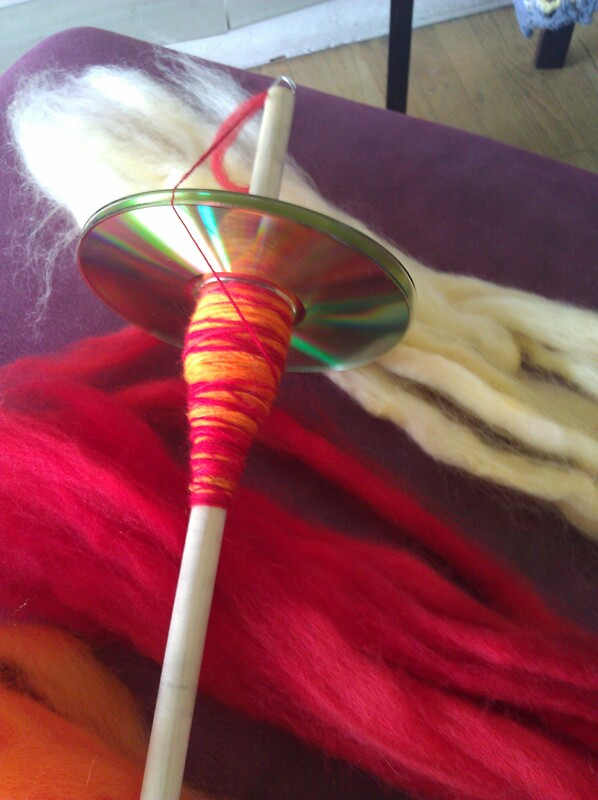 So, i’ve jumped back on the spinning bug! I learned to spin well over 15 years ago and never really stuck with it because i didn’t have a wheel. Believe it or not, non-spinners, those things are prohibitively expensive! example–i saw a sweet double treadle this morning–$1000. yeah. You may now understand why i strayed. BUT–you can spin without a wheel. In fact the women of ancient times spun without one hundreds of years before the spinning wheel was invented. All you need is a stick and a whorl–and physics. (yes, George–former high school physics teacher–, i actually, knowingly use physics in my daily life! And yes, i know i use it everyday anyway. i WAS paying attention way back when–just not that strongly). The wheel just increases your productivity–not necessarily your skill. So after seeing a few friends post their new love of spinning, and feeling insanely jealous because store bought wool yarn is soooooo expensive, i busted out my drop spindle, watched a few You-Tube videos to remind myself of the skill, ordered some wool roving and started a twist. I won’t bore you with my early attempts. THey’re ugly. Like any new skill, i needed practice–and practice i did. Eventually, i was ready to ply. And thus began my search for the perfect tools. See–when you spin you create “singles” with which you have two options–set the twist (wash and let the twist that’s being held in the yarn “settle”) giving you a single ply yarn, or ply–twist two singles together in the opposite direction which settles the twist and makes for a stronger and more even yarn. Since i’m still getting the hang of it, and have a strong fear of felting, i opt to ply. But the wheels have a handy tool, usually, called a lazy kate–where you set your spools of singles to unwind while you ply them together. 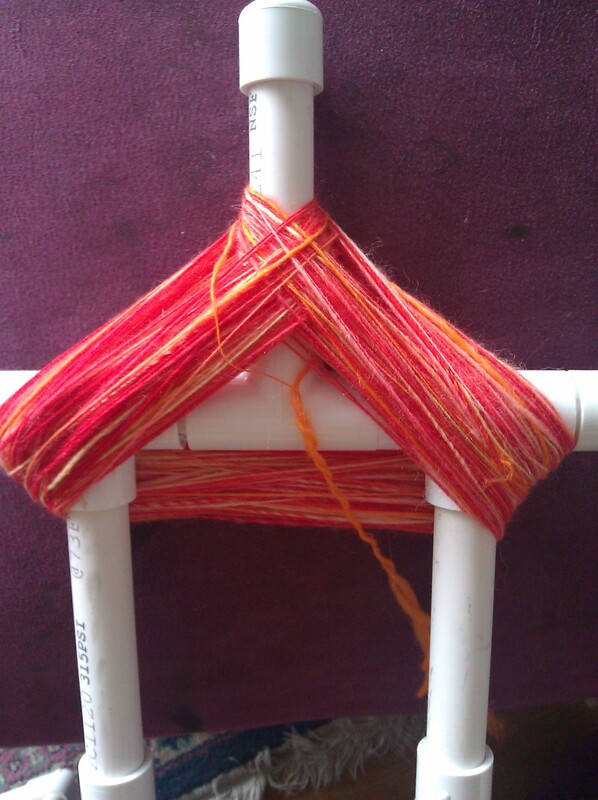 If you use a drop spindle–you don’t have that. So i would skein the first single with my PVC pipe niddy noddy–just a measuring tool that also allows you to tie off your yarn in neat hanks, and set it aside while i spun the second (first realization that i need more than one spindle) and while i was spinning the second, the twist in the first was realaxing because it wasn’t being held with any serious tension. so, i turned again to the internet and discovered Andean plying--plying with ONE skein of yarn. so i spin, wrap the andean bracelet, and ply. 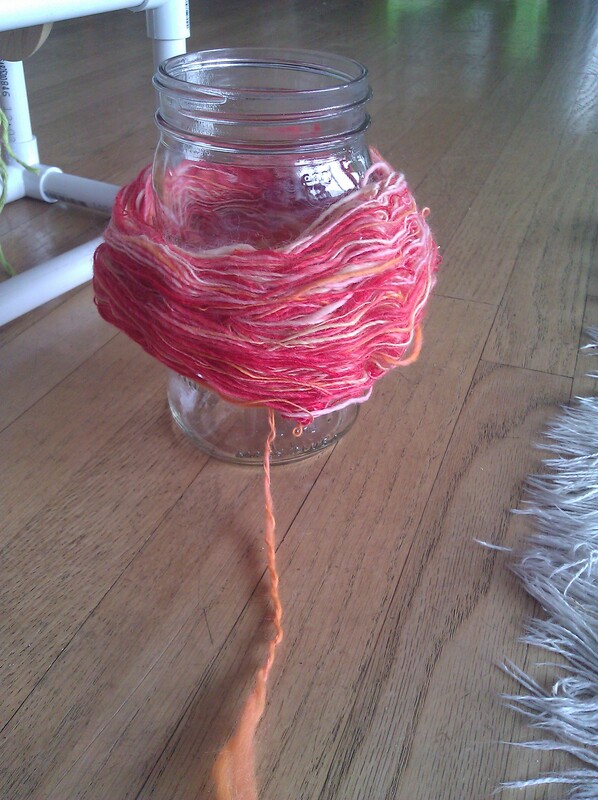 Instant (in spinning time, anyway) yarn. But if you wrap on your hand as you are instructed the first time, you realize your middle finger loses all circulation and it’s NOT comfortable. So, i need another tool. preferrably cheap. I scour the internet only to find an expensive wooden tool and the suggestion to use a book and a pencil. Yeah–how long will THAT last? LIGHTBULB! 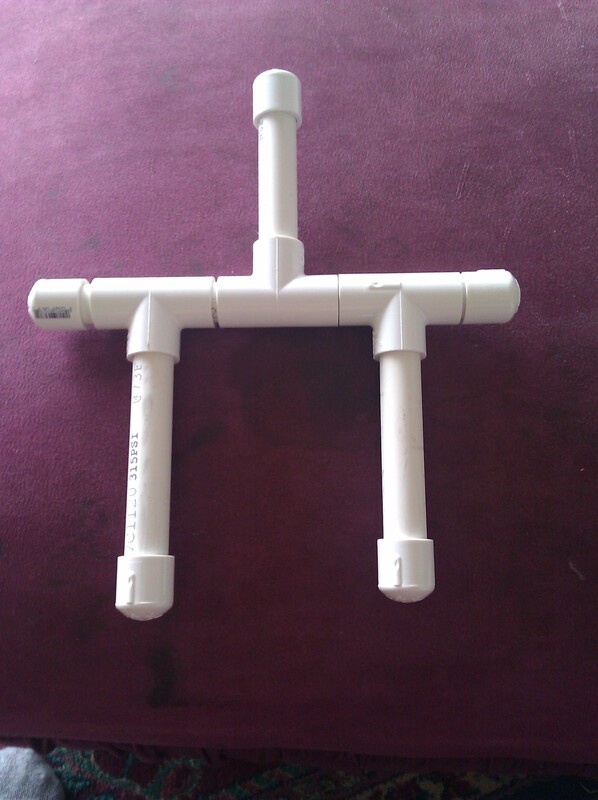 i made the niddy noddy out of PVC pipe. Why not my own andean plying tool? So i bought some t-joints (3) some 1/2 inch PVC pipe and some end caps for neatness. I made the pretense of measuring, but not really. Also–in order to accomodate the larger yarn made from plying–and to produce more yarn than my lil Shacht spinde would produce, i make a spindle from old CD’s, rubber grommets, a wooden dowel and a picture framing hook that i bent. 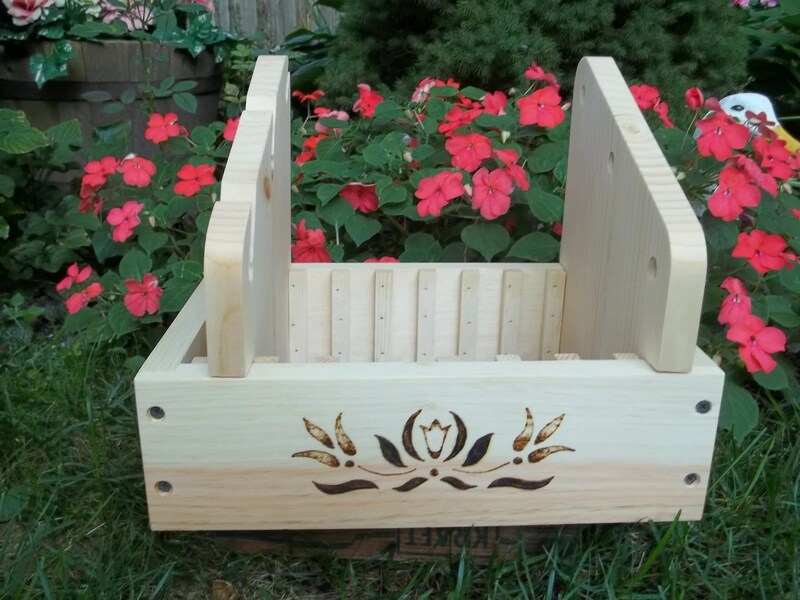 it ain’t as pretty or smooth–but she holds ALOT of yarn. You can find instructions here, or just do a google search. There are alot of sites. Next post i’ll discuss the other tool i had to create: the PVC lazy kate. Or would that be the cheap kate? Also–if you are interested in starting to spin yourself, or just wonder what the hell i was blathering on about, check out The Joy of Handspinning’s website. 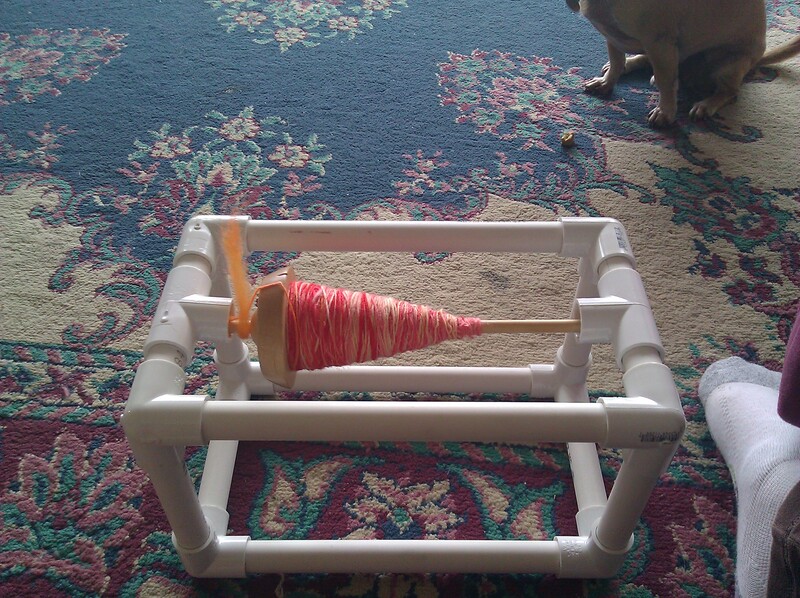 This entry was posted in spinning and tagged andean plying, drop spindles, pvc pipe, spinning, wool. Bookmark the permalink.